Betty Tuinsma Bussies was born at the original Holland City Hospital on April 6, 1927. Betty grew up with one brother and two younger sisters. Her father was in the military, which required her family to move several times within Wisconsin and Michigan. They returned to Holland when her father was sent overseas during WWII. Unfortunately, he passed away in 1945 due to a heart condition from the war. 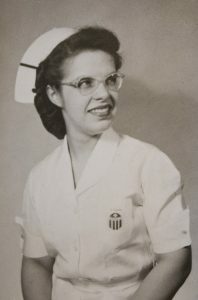 Out of her desire to care for others, Betty pursued nursing with the U.S. Cadet Nurse Corps. She attended St. Mary’s nursing school and completed three months of psychology training at Kalamazoo Regional Psychiatric Hospital. Betty graduated in 1948. The ceremony was held at the Cathedral of Saint Andrews in Grand Rapids. After graduation, she served for six months at the Hines-Vaughan Veteran Hospital in Chicago, Illinois. The cadet program was the first integrated uniformed U.S. service corps and was a response to an urgent need for nurses during WWII. Since many nurses were called overseas to military service and other women were attracted to the defense industry, civilian hospitals were left significantly understaffed. 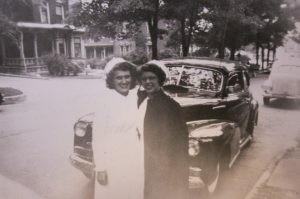 In October of 1948, Betty moved back to Holland for a nursing position at Holland Hospital. She and her husband, Roger, lived close enough that Betty could walk to work. She remembers coming in the front entrance and having to go upstairs to get to the first floor. The pharmacy was at the top of the steps next to the office of Superintendent, Miss Rena Boven. Betty held on to her first monthly paycheck stub from the hospital for $140! Though obstetrics was Betty’s favorite unit, she worked in whatever area was necessary. During her shift, there were typically three or four other nurses working. They split the patients between the first and second floors. Betty loved being able to help others and always went the extra mile to get a warm blanket or a cup of coffee for her patients. It was the little things that made her such a great nurse! 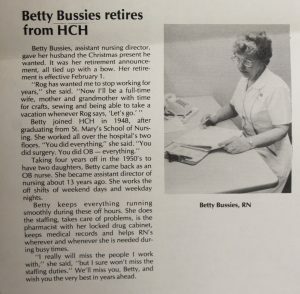 Later in her career, Betty became the Assistant Director of Nursing under the leadership of Mrs. Alva Bouman, Director of Nursing, and Mr. Fred Burd, CEO & President. She recalls the changes at the hospital over time. 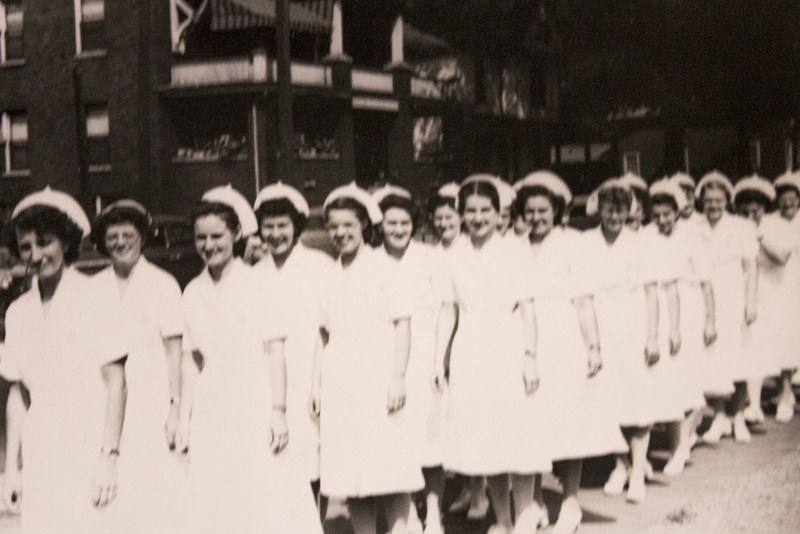 When she began, nurses were still wearing white starch uniforms, capes and hats. Now she says it is hard to tell a nurse from a maintenance man! The technology has also evolved. Betty remembers the days when IV bags were connected to rubber tubes and the nurses would clean and reuse them! When Betty’s daughters were pregnant with her grandchildren, Steven and Peter, Betty decided to retire. All along, her husband disliked that she worked. He had a steady job with Herman Miller and there was no need for her to be working while they had children at home. After their second baby was born he lovingly said, “You go back to work and I find a new wife!” But Betty hadn’t gone to school for nothing and she loved her job. Even against Roger’s wishes, she pursued her career for many years. For Christmas of 1982, Betty made a little collage announcing her retirement the following year. She wrapped it up and gave it to her husband. It was the best gift he ever received! During her 35-year career, Betty was able to impact many people’s lives. In fact, she recently sat next to a woman in church who recalled a time when she was in the hospital and Betty was her nurse! Betty admits the patients remember her more than she can remember them. However, she loves these moments when she and a patient are able to connect. Betty turned 90 on April 6, 2017. She celebrated with her sister Joan, daughters, Karen and Ellen, three grandchildren and three great grandchildren. Betty’s friends from the area also joined her in celebrating this great milestone.